How do I automatically redirect one web page to another? It's sometimes the case that you'll want one URL to automatically forward to another. We'll look at several approaches to redirecting URLs. How do I redirect a web page to another? I have a page with a .dk top level domain and one with .com and would like the .dk to automatic forward visitors to my .com domain. I've found 4 lines on the web describing the code but it doesn't work. And can the same be done if you just own the domain name and doesn't have space on a web server? This is one of those things that I do just infrequently enough that I can never remember the exact syntax, and I end up looking it up again from the last time I did it. Fortunately there are a couple of ways, depending on what kind of access you have to your domain and/or server, and what kind of functionality your domain registrar or DNS provider gives you. If all you've done is register the domain, but have not actually provided for a web server to serve up pages from that domain, you'll be relying on the DNS functionality that your registrar has provided. DNS is normally where you tell the world "this domain is at that IP address" (using an A record). Without a server there is no IP address, so you need to do something different. One common approach is to create a CNAME record. It's similar to an A record except that it says, in effect, "this domain is really that domain". The "catch" if you want to call it that, is that the web server that will eventually serve up pages for this domain must know about it. "Exactly how that's done will vary based on which DNS provider you happen to be using, which features they happen to expose and how." Another approach, depending on the features your registrar or DNS provider gives you, is called a "url redirect". That allows you to specify something much like "this domain should redirect to that page". This is also very powerful in a couple of different ways. 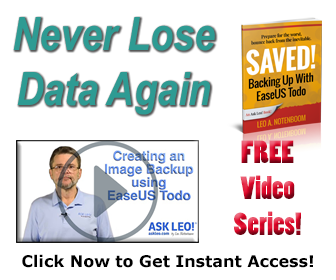 Without any server-side work, "askleo.info" redirects to "ask-leo.com". All it took was a URL redirect in my registrar's DNS control panel. Perhaps more interesting is "newsletter.ask-leo.com" which uses a URL redirect to send you instead to "ask-leo.com/newsletterinfo.html". This actually relies on features supplied by your DNS provider or registrar, so you'll need to check for availability. All of the steps above involve dealing with your DNS provider. I say "DNS provider or registrar" above because most registrars provide DNS functionality as part of their service these days. What I can't tell you are the specific steps you need to step through to set an "A" record, create a "CNAME" record, or create a "URL redirect". Exactly how that's done will vary based on which DNS provider you happen to be using, which features they happen to expose and how. If the domain you want to redirect is already pointing at a server on which you can place ".html" files, there's another technique that doesn't require any DNS work at all. It uses HTML to perform the redirection automatically. The technique is typically referred to as a "meta refresh", and is the one who's syntax I keep forgetting. The line of interest is the fourth line that begins with "<meta". The operation is "refresh" which means to "refresh" the current page with the information that follows. The content begins with a zero, which is the number of seconds to wait, and then the URL that you should be taken to. Thus when you visit http://ask-leo.com/currentnewsletter.html you'll be immediately redirected to the page containing the current newsletter. Most of you will, but not all. Meta-refresh can be disabled by the user so the alternate, manual approach is still required. That's why it's important to include the text in the actual page instructing people to "click here if you're not automatically redirected". I'm expecting that the prior methods will be appropriate for 99% of the people who might be interested in the topic. But I feel I have to include this technique for the 1% group - the group that I'm actually in, since this is what I do for most of my sites. If you have an Apache web server, or another server that supports the same functionality, and it's configured to allow URL Rewriting in .htaccess files or you have access to the configuration files for the web server, then you can do redirection a slightly different way. First, you would simply point your domain to your web server as if you were actually hosting it there. In your case, you'd go ahead and point your ".dk" domain with an "A" record to your web server. Then, you would configure your web server to actually host that domain. That'll send all the requests to the redirected target. Ask Leo! - How do I direct my web traffic to a single domain? Ask Leo! - Why does the URL change when I go to some pages? .dk works exactly like .co.nr (except with advertisements). Say you wanted site.dk to display freewebs.com/site, then you configure site.dk to show freewebs.com/site (in a similar way to using CNAME i believe), however, site.dk will show freewebs.com/site as a frame, and the URL in the address bar will stay the same as long as you click links that dont open a new webbrowser. My advice for the person who asked this is to rent a cheap server. If you cant find one, i highly recommend precision-media.net and go with their $10 plan. Good luck on your site, and leo: I Know where to come when im stuck on HTML coding now ;) thanks mate. I know how to redirect to a webpage but what I want is to redirect to a totally different webpage if Primary Redirected page is down. So if PAGE_A is being Redirected to PAGE_B but if PAGE_B is down it should redirect somehow to PAGE_C. Is it possible? Is it possible within a table cell on one web page to show the contents of another web page? Yes, thats called an iframe. Hi, I know how to use the Meta refresh. I've used it on my website to forward everyone to a diferent website.It's nic because it keeps my original domain name in the web browser. crossroadskenner.com does a meta refresh to http://www.onestopwebonline.com/crossroads/. Unfortunately, if one of the pages on the onestopweb site is longer then the page on crossroadskenner.com, then the page is cut off at the bottom. Also there is a white border around the page. I can make my page size larger on crossroadskenner.com however that makes every page long even if the page on the other site doesn't have anything on it. Is there a simple way around this? I'm a novice at this and am not sure about the A record and cname stuff. My domain is hosted through offivelive.com. I happened to get in when they were Betatesting officelive.com and gor my domain and web site free. I could move the domain, but then I would have to start paying a fee to maintain the domain name every year, where Microsoft is currently maintaining the fees. If I change the domain name then I will have to start paying for it. So I'd like to maintain my domain where it's at and forward to a different page. Officelive dosen't offer some of the features that onestopweb offers which I like. What about cases that I need to get some data in the response from the remote server? Case of client requesting server1 and him, in turn, request server2 for the data (that needs to go back to the client). Great points and tutorial. In order to transfer any search engine relevance of inbound links you should definitely do a 301 redirect in your .htaccess file. instead of a manual link. It worked better in my circumstance. I am using Bravenet co.nr and would like to redirect to my new website which is a .com. I did html access which worked when I click "webpage preview in microsoft publisher. But when I put the page into bravenet I get "The webpage cannot be found"
I just bought a domain name from google. I am wondering how to add this domain to an existing page? Thanks!!! Good information. I generally use 301 redirects for all my domain redirection - it helps forward my retained pagerank of my old domain to my new one. Question - doesn't the html redirect screw up your page with Google (i.e. de-indexing). I was going to use it but others have warned me against it. Unknown. Google doesn't share their secrets. One would hope it would not affect thigns poorly, but there's no way to know for sure. Also be aware that Google's not the only search engine. I have a similar question relating to this topic. I've recently acquired http://listen.to/djx ..I wanted to give my friends this link so that they can easily remember, what my problem is the HTML part. I do online radio, what I needed them to do is, when they click or put http://listen.to/djx it would go to my music that instant, so they do not have to go to the server am using http://www.onlineradio.com:port ..I've seen them on some blogspot. they have a black square where it says "loading" (appx 100x100 pxl). Can anyone help? **(the links posted may or may not exist its just an example) any duplication of any website is purely accidental. I cannot understand redirecting at all. Is there a 301 redirect with enom? I purchased domain (bazics.net) through blogger. I want to 301 redirect every url of bazicsnewsfeeds.co.cc to every corresponding url to bazics.net. For example, I want to redirect bazicsnewsfeeds.co.cc/someotherpage to bazics.net/someotherpage. But I have not seen a solution about this. Can you help me please? I want to know how to write html mail.I do have gmail account and knowledge of html.Now please tell me if I type html tags over gmail mail editor program,it simply send content as it is.So,how to do this job so that my html taggged mail present at reciever side as html mail?? ?hope your are get I want to say?? If you click on "Rich Formatting" in GMail's web interface you're writing HTML, but not HTML directly (i.e. you can't enter HTML tags yourself and have them be meaningful). I'm not aware of a way to do that in GMail's web interface - you'd have to use a desktop email program and Gmail's POP3/SMTP interface. With these capabilities for automatic redirection to other web pages, it is possible to set up a redirection loop -- try to avoid making it a no-wait-time infinite loop! (An infinite loop with a reasonable delay, on the other hand, might have its uses as a sort of slide show, among other possibilities). Thanks Leo! I was over-thinking the matter and your article helped simplify my methods. The meta command in the header suggestion worked flawlessly.